I was out of practice today! The first person I chose, a young lady whose name tag said Frey, appeared to be taking a break from her job at a local restaurant. She never said anything to me as I explained what I was doing. She just looked down at her phone and finally shook her head no when I asked if she would accept my $10. I picked myself up and went searching for another person. There were lots of options as the streets near Dupont Circle are full of people. 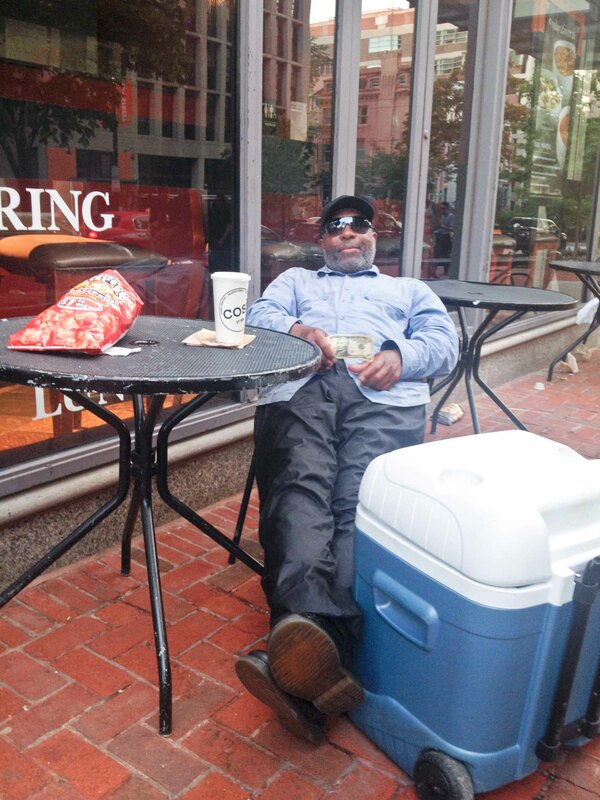 Stretched out on a metal chair on a rain washed street terrace in front of a Cosi restaurant, Thomas was just taking in the sights and sounds of the bustling streets of our nation’s capital. With a drink, bag of Cheetos Flamin’ Hot Popcorn and cooler surrounding him, he smiled and said, “I was just sitting here relaxing, kind of in a transcendental state you know.” I asked him about the cooler – I thought he might have been selling some cold drinks. “Nope,” he said, “I just use this to carry around my stuff. It’s sturdy and has a nice lid that I can even sit down on if I need to.” I can just see my Dad adopting this idea and traveling around with a cooler after he reads this! Thomas grew up in Washington and we figured out that we knew a few people in common. He knew Elijah from Day 185 and Connie from Day 319 of my Year of Giving. 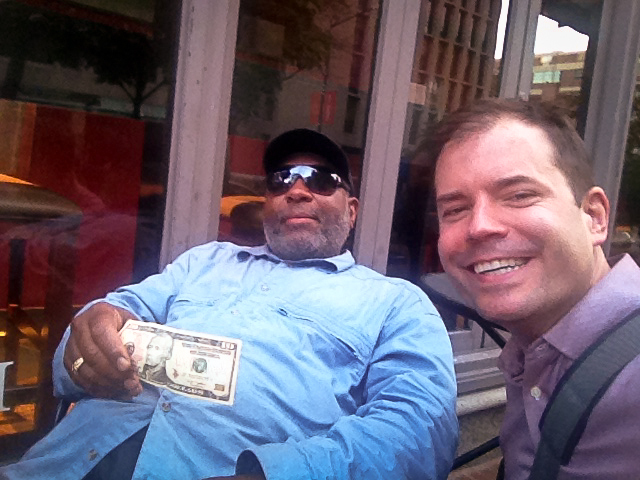 I asked him what he was going to with the $10 and he said he was going to probably get some food, band-aids and maybe put a few dollars in the cup of a street musician who was filling the air with the melodic riffs of a guitar. Man, I miss this! So happy to be celebrating the Worldwide Day of Giving – takes me back to my 365 day journey in 2010. Good times! If you want to know what I’m up to now, check out the Year of Letters. Five years ago I started the Worldwide Day of Giving. It is a very special day that was started on this date in 2010 as part of the Year of Giving. Participating is simple and can be done from anywhere in the world. You can be a part of the Worldwide Day of Giving by doing one of three simple activities! For more information on how you can be a part of the Worldwide Day of Giving, click here.